Curiously, despite the slowdown in the market, prices remained at nosebleed levels, suggesting that sellers are not in a rush to sell. Detached homes sold for an average of C$1.59 million, down 1.6% from a year ago, and apartments averaged C$700,055, up 13.6% from July 2017. The overall composite benchmark price fell just 0.6% in July to C$1.09 million, which is still up 6.7% from a year earlier, and remains unreachable for most ordinary buyers. The report signals buyers are still adjusting to tougher mortgage qualification rules the federal government introduced Jan. 1, and more worryingly, to the four increases in the Bank of Canada’s trend-setting interest rate over the past year. Those rules were put in place after surging prices in both Toronto and the Pacific coast city led to warnings about excessive speculation. "With increased mortgage rates and stricter lending requirements, buyers and sellers are opting to take a wait-and-see approach for the time being", Moore said. So will prices catch up to the collapse in sales? According to the REBGV, for all property types, the sales-to-active listings ratio for July 2018 is 17.1%. By property type, the ratio is 9.9% for detached homes, 20.2 per cent for townhomes, and 27.3 per cent for condominiums. 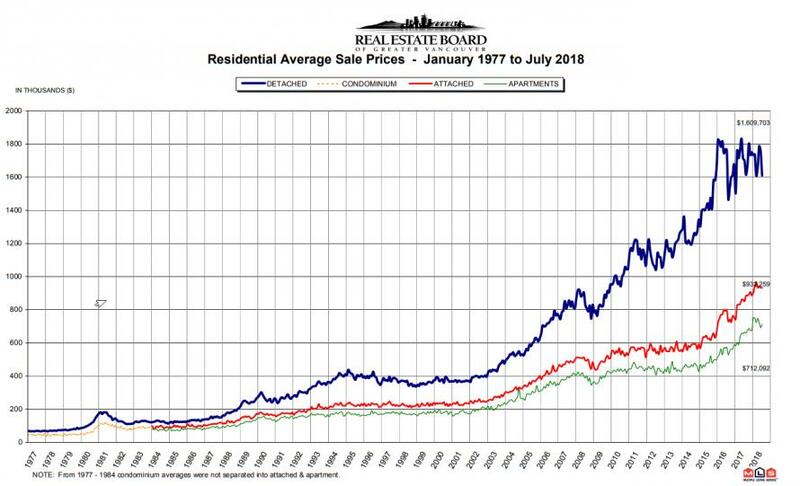 In other words, with the surge in detached listings coupled with the lack of declining prices, all that Vancouver's real estate market needs is a spark that launches the selling deluge; however since the bulk of purchases were made "all cash", and in most cases sight unseen, it is unlikely that further monetary tightening will be the catalyst that finally pops one of the world's biggest housing bubbles.